A man was going from Indianapolis, Indiana, to Louisville, Kentucky, when along the way he had a flat tire. Stranded on the side of the road, he was robbed, his car was stripped, he was shot, and left for dead. A Baptist pastor, on his way home from the annual meeting of his denomination, saw the man. But he had a report to deliver to his congregation about the virtuous resolutions passed at the meeting he had just attended and an important sermon to preach about our culture’s deteriorating family values. Besides that, his children were in the car, and he refused to traumatize them with this carnage. So he never took his foot off the accelerator. A few minutes later, a Bishop of the Methodist church came driving by. A successful woman, she sat on the board of Focus on the Family, the National Association of Evangelicals, and Concerned Women for America. Considering the scene before her, she concluded that her work in these organizations must continue. It was the only way to stop such meaningless acts of violence; violence most likely perpetrated by dangerous gangs of teenagers who were the products of broken homes and without the proper Judeo-Christian guidance. She was a mile past the scene of the crime before she called 911. Then a third traveler came upon the victim: A cocaine dealer and cartel member. A man who was in the country illegally, who had booze on his breath and marijuana in his bloodstream, and who hadn’t been to Mass since he was a child. He saw the shooting victim and somehow his heart was broken with compassion. He steered his car to the side of the road and jumped out with a first aid kit and a bottle of water. He triaged the wounded man the best he could, loaded him into the back seat of his car, and drove him to the hospital. Of course this question is not mine and neither is the story. It is a question and story that belongs to Jesus. 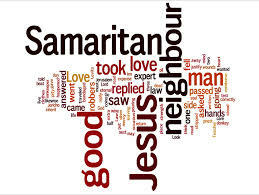 It is a retelling of the parable of the Good Samaritan. Jesus framed as radical a possibility conceivable by the community of his day – far more drastic than anything I have said here. He took a known pariah, a well-established outcast and no-gooder, and turned him into a moral and spiritual hero – all at the expense of the upright church-goers. Jesus told such a story, not to define the boundaries of neighborly behavior, but to define what it means to love. Graphically, he showed his listeners that those who do not fit into our religious boxes, our precise doctrinal categories of right and wrong, and our church systems are sometimes more capable of acting like God than we professionals who pride ourselves in saying we know who God is. After all, to act like God is simply to love. And to love, it is not necessary to have perfect doctrinal integrity, to get the details of church “right,” or to be as religiously and moralistically pure as possible. No, to love like God is to dirty our hands by helping our neighbors – “to do to others what we would have done” for ourselves. Clucking our tongues, shedding a few tears, and simply observing the pain of our world while keeping a religious and respectable distance from the suffering is no substitute for binding wounds, wiping tears, and embracing those in need. We might just need such an embrace ourselves one day – even if that embrace comes from the most unlikely of neighbors.